When voters head to the polls Tuesday to cast ballots in the 2018 midterm elections, they may not be thinking about Harvard. But the way they vote could have serious reverberations in Cambridge. Ranging from taxes on its $39.2 billion endowment to the immigration status of its undocumented students and workers to the survival of its controversial social group sanctions, the University has a large stake in the outcome of this year’s midterms. In the run-up to Tuesday, University President Lawrence S. Bacow has been busy lobbying legislators to keep Harvard’s interests in mind. He’s traveled to Washington, made a series of phone calls to prominent lawmakers, and met with VIPs around the country. As he lobbies Congress, Bacow has kept three main Harvard interests at the top of his mind. The Crimson breaks down what they are — and how the midterms could affect each one. One of the president’s top lobbying priorities is convincing legislators to repeal a recently passed tax on Harvard’s endowment. Enacted during the 2017 Republican tax overhaul, the legislation requires Harvard and other institutions with endowments greater than $500,000 per student to pay a 1.4 percent excise tax on endowment returns. The tax — which will take effect for the 2019 fiscal year — would have cost Harvard $43 million in 2017, according to University estimates. 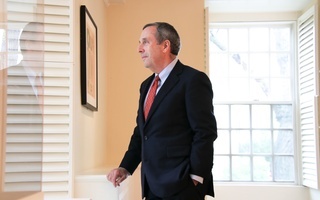 Soon after taking office, Bacow journeyed to Washington, D.C. to persuade legislators that the endowment tax will not accomplish their stated goal of making college more affordable. 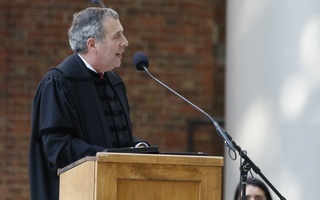 In an interview last month, Bacow said the tax will not only increase the cost of higher education but will also make it harder to raise money for financial aid. “Whether or not that results in changes in the law will depend upon both the outcome of the elections and what gets introduced as legislation in the next Congress,” he added. So, how could the midterms affect the tax? The vast majority of Democrats oppose the endowment tax and prominent party leaders including Sen. Elizabeth Warren have spoken out against it. If Democrats earn the 23 seats necessary to regain control of the House of Representatives Tuesday, Bacow’s goal of rescinding the Republican-backed tax is probably one step closer towards reality. A Washington Post-ABC news poll released Sunday showed Democrats in the lead in the battle to retake the House by seven percentage points. 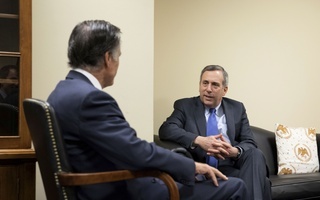 Though he has not returned to Washington since his first trip, Bacow recently met with House Minority Leader Nancy Pelosi at Harvard to discuss immigration — another issue high on his list of University concerns. Bacow said he and Pelosi spoke about Deferred Action for Childhood Arrivals and Temporary Protected Status, two Obama-era policies meant to protect undocumented youth and adults. Almost immediately after taking office, President Donald Trump began rolling back these programs — and hasn’t let up since. He repealed DACA in Sept. 2017 — though courts have since challenged his decision — and curtailed TPS, suspending it for individuals from certain countries, in Jan. 2018. In a January interview, Harvard spokesperson Melodie L. Jackson said the Trump administration’s efforts to curb TPS will affect “several dozen” workers at Harvard. The school had roughly 65 undocumented affiliates in 2017. Students and staff have called on Bacow to follow in the footsteps of his predecessor, Drew G. Faust, by publicly advocating for the continuation of DACA and TPS. 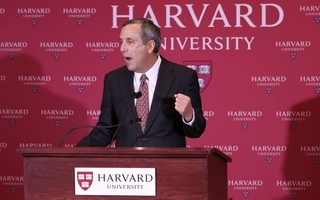 “I made a number of statements in my inaugural address about the importance of continuing to be open as a country to those who seek freedom and opportunity, as well as to those who would like to come to Harvard to study and to work,” Bacow said in an interview last week. If Democrats take the House, Bacow’s stated mission — protecting Harvard affiliates eligible for DACA and TPS — could get easier. Pelosi has said protecting DACA beneficiaries is a legislative priority. Some analysts have suggested that, if the midterms usher in a blue wave, the Democrats could seek to trade DACA or an expanded version of DACA for Trump’s long-promised border wall. And, though Democrats cannot overturn Trump’s executive orders, a Democrat-dominated House could take steps to aggressively scrutinize the administration’s DACA and TPS policy shakeups, among other things. Tuesday’s election could also reshape the fate of Harvard’s controversial sanctions on members of unrecognized single-gender social organizations. The penalties, which took effect with the Class of 2021, bar members of single-gender final clubs and Greek organizations from campus leadership positions, the captaincies of varsity athletic teams, and from receiving College endorsement for prestigious fellowships like the Rhodes. But a bill dubbed the PROSPER Act could imperil Harvard’s ability to enforce its sanctions. The PROSPER Act, a revision of the Higher Education Act, includes a provision that could bar the University from penalizing students who join single-gender social groups. If it passes, Harvard might be forced to choose between its sanctions and millions of dollars in federal funding. But it’s probably not going to pass, experts say — and a blue wave would only decrease the bill’s shot at becoming law. Democrats are unlikely to support the PROSPER Act, which Republicans proposed in the first place. Even for Republicans, the bill is not a top priority, analysts say. The amendment related to social groups is just one of many provisions contained in the bill. Others include acts that could limit some students’ ability to pay for college. The House Committee on Education and the Workforce voted the bill out of committee in December 2017. Legislators have yet to schedule it for discussion on the House floor. Former University President Drew G. Faust that in a May interview that Bacow would be "very much focused” on the reauthorizton of the act. 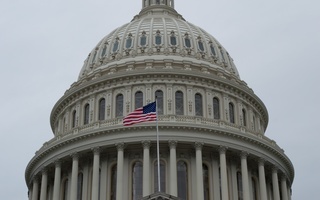 Bacow said in an interview last week that the PROSPER Act will likely fail to pass in Congress, though he noted that alterations to the “form” of the bill may change that.